I grew up watching a VHS recording of The Nutcracker ballet every Christmas. It was a fantastic production, wondrous and magical. I've loved the story (and the music) ever since and for a while wanted to write a retelling of it. Then I my critique partners and I decided to do anthology of retellings, and I decided to do on of E.T.A Hoffman's The Nutcracker and the Mouse King, which inspired the ballet. It was so much fun to write! So much so I ended up with two versions. :) And then it was so much fun to go see a very different retelling in Disney's The Nutcracker and the Four Realms. I very much enjoyed the movie, and here are three reasons why you should go see it if you haven't already. It was a good story, sad in places for sure, but sweet and clean in a time when many stories aren't. I liked the adventure and the beautiful Victorian setting at the beginning and Clara and Philip (the Nutcracker) were very likable. I not only enjoyed picking out characters from the The Nutcracker story (and smiling at the fact they gave the nutcracker character the name Hoffman, after the author) but also seeing familiar actors--Keira Knightly as the Sugar Plum Queen and Matthew Macfayden (Little Dorrit and Pride and Prejudice) and Morgan Freeman as Drosselmeier. 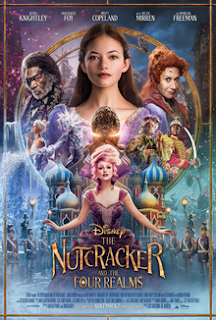 All in all, it was a great movie, enjoyable even for the friend who went me who didn't know a thing about The Nutcracker ballet or original story. Have you seen the movie? If so, did you enjoy it? My daughter and I went to see it, and I loved it. While I still prefer the original version, I had fun watching this one, too :).